1. What are you up to in Japan? Studying? Traveling? I am in Japan studying. Last year I decided to embark on a huge adventure and move to Japan to study Japanese full time. I lived on a very tight budget and saved every cent so I could afford to live here for year. I also hope to fit some travelling in - around Japan and, if money allows, would love to visit Korea as well. 2. How did you hear about We Love Colors? I heard about WLC through various web sites then got hooked on the style blog. I'm much more inspired, fashion-wise, by "real" fashion and seeing how various bloggers style outfits than some out of reach fashion shoot. I have always loved wearing tight and think that they can make an outfit. 3. How was your experience with your We Love Colors order shipping to Japan? The shipping to Japan was absolutely fantastic. A few days after I put my order in, my housemate told me I had a parcel arrive in the mail and I thought it couldn't possibly be my tights so soon after I ordered them! 4. Have you noticed any fun tights trends while living in Japan? I think tights are an absolute fashion essential here because girls love to wear shorts and short skirts even in the middle of a very cold winter. There are always crazy tights + knee socks combinations. Leg warmers are also very popular. At first, I wasn't into that at all but I've been converted. A pair of thick tights is enough to keep the cold out in the day time but when the sun goes down (the nights here are freezing), it's so handy to have a pair of legwarmers in your bag to throw over the top. I've noticed lots of stripes in the new fashion looks in the shops for spring. 5. What is your favorite activity to do in Japan? My favourite activity in Japan is eating. I love trying all the different food available here. I never ate fish at all before I moved here but I've got to really love it. I love all the food on sticks - like yakitori. I even tried heart and other body organs on sticks the other day! Thanks so much Kathryn! We wish you good luck in your studying and safe travels. 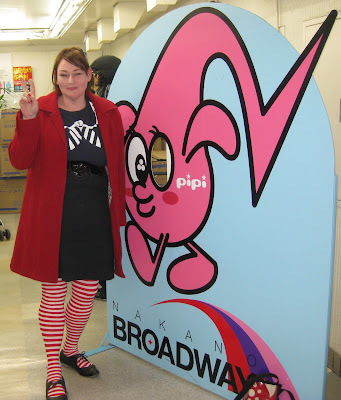 Check out Kathryn's blog at http://www.project-kathryn.com/ to see more of her photos from Japan!